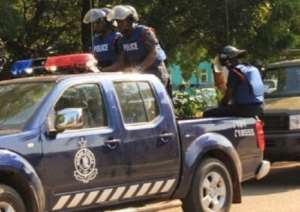 Four loyalists of the governing New Patriotic Party (NPP) in the New Juaben South constituency of the Eastern Region, are in the grips of the police for allegedly breaking into the house of the constituency secretary and bolting with the album for the upcoming constituency election. Two of the suspects, Alex Owusu alias Gunta and one Wadoski, are believed to be among a gang of four allegedly hired by the constituency organizer, Obeng Manu to perpetuate the crime. The four allegedly forced open the house of the secretary, tied one Pius Tevi, an occupant of one of the rooms with a rope, blindfolded him before bolting away with envelopes containing the constituency album, mobile phones, cash amount of GHs 4,000 and other personal belongings. Briefing Journalists, New Juaben District Police Commander, Chief superintendent Cosmos Alan Anyan explained that Alex Owusu mentioned the names of Tanko, Mafia and Wadoski as his accomplices. According to him, Wadoski after his arrest named Obeng Manu and Justice Peter Afful alias Oboo Yankee, as the masterminds of the crime after paying GHs 400 as part payment of GHs 1,000. Chief Superintendent Alan Anyan said the constituency organizer, Obeng Manu, who was later arrested denied claims of hiring the thugs. The Police Chief says they are treating the matter as a criminal case and will arraign the suspects before a court Wednesday.